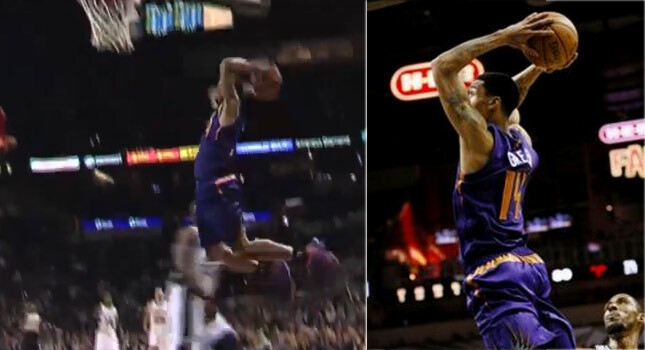 After an impressive return to the NBA with the Nets in 2012, Gerald Green earned himself a new fat paycheck and spot on the Indiana Pacers where he struggled to fit in more than he struggled to make that double dunk in the 2013 NBA Dunk Contest. This summer, Green was acquired by the Phoenix Suns in the Luis Scola trade and after last night’s 19 point performance against the Spurs, it looks like Green has found a system where he can flourish again. ASU associate head coach Eric Musselman seems to agree. “I look at him as a guy that in 20 years I’ll still be talking to him,” Musselman said. “When he was with the Nets and they played the Lakers (in L.A.) he came back to our practice and sat for a two-and-a-half hour practice, and it was on a game day. You don’t see many NBA players leave their hotel on their own, figure out a way to get there, stay and then hang out with (his former) teammates in the locker room afterwards. That’s the type of person he is. I think the Suns have done a great job of getting a guy kind of under the radar that you can have in your rotation. He gives you energy and an identity because he can get up and down the floor, which is what coach (Jeff) Hornacek wants to do. And he’s a better defender than people think as well. Sometimes he needs to be a better off-ball defender, but that will come in time.